Eh, that's good enough for me! Hey that one guy! Long time, no see. 2016 is shaping up to be the worst year of my gaming life but oh well. This is the best I can do for now, so you're getting another crappy pickups article. I'm pretty sure I was supposed to post this... spring? summer? maybe? 1947? I can't keep up anymore! But it's probably for the best anyway, 'cause I'm not so sure there's going to be very many of these going forward. After my last post, I've put a lot of thought into my collecting habits and decided they're probably going to slow down considerably for now. I know myself well enough to know there's still going to be plenty of purchases, but probably not enough to warrant seasonal Kicking Gnomes. But we'll see! I have a habit of saying "I'm done" with something and then quickly changing my mind, but for this year, this is probably gonna be it. So let's enjoy our sweet, sweet time together. For 360, I finally picked up Alan Wake - a long overdue purchase since the Cartridge Club played the game back in March, but I couldn't find a copy then to join in. They made it sound like a fantastic title, though, so I'm anxious to check it out. 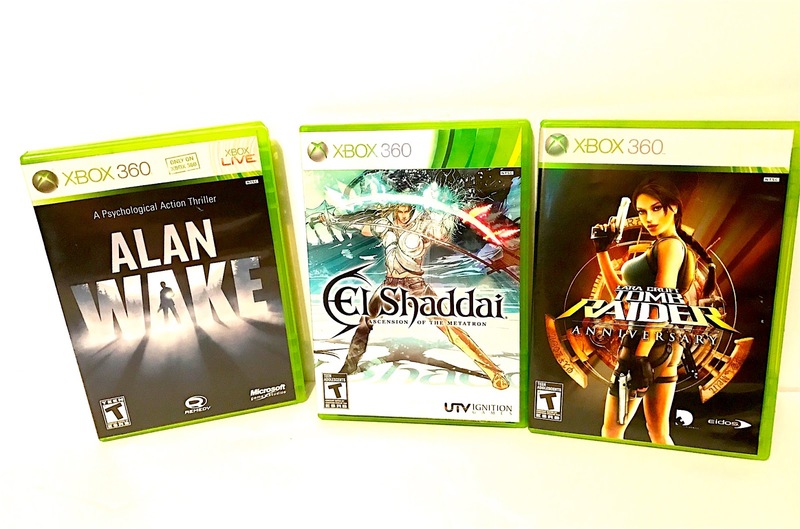 I think Tomb Raider Anniversary and El Shaddai may have been bought together. I seem to recall fishing Shaddai out of a bin and deciding it looked interesting, but I needed a second game from the same bin to get the deal so I grabbed TR thinking it would be easy to pawn off on someone if I decided not to keep it. In a strange turn of events, I found Fire Emblem: Awakening - used - at a GameStop. I almost never find Nintendo titles used at the store so I figured I should capitalize on the rare occasion to save a few bucks. It would have wound up in my possession at some point anyway; I'm dying to get back to the Fire Emblem series... I'm so behind! The Legend of Zelda: Majora's Mask 3D I deliberately picked up months in advance for July's CC game of the month. Fat lot of good that did me. I went out of my way to line up this year's CC games as best I could, but my schedule had other ideas and I barely got to play it at all. Majora's, in particular, is a game that requires constant attention... it's simply not the kind of game you can pick up here and there and keep going. The time constraints and twisty nature of the plot just demands more from me and I couldn't muster the time to get through it, but I think I will hang onto this a while longer and try to find the time for it. I've played MM in the past on N64 and recall it being a different experience for Zelda games, so I really want to see it through in its shiny new 3D format. In the meantime, the Club did a fantastic analysis on the podcast! Go check them out! Also pictured there is the guide book, which I think they gave me for free. It's pertty. Continuing to build my PS4 collection, I found a stupid excuse to get out of work one day to run out and grab Doom while it was on sale. 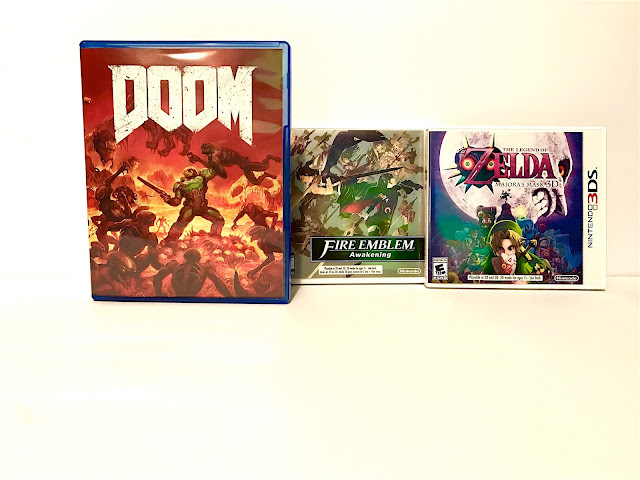 Doom was one of the most pleasant surprises from last year's E3 and I'm still super excited to try it but alas, it looks like - like everything else - it's gonna have to wait. But people are still raving about Doom which makes me very happy. I also began my PS4 digital collection with a few choice titles that were on sale. 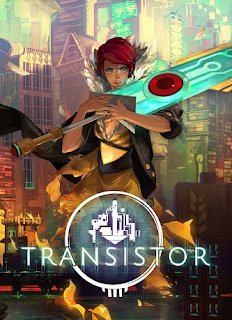 I picked up Transistor for $5 or so. After my incredible experience with Bastion, there's little anyone can do to stop me from checking this one out. Another game many have recommended to me is Child of Light. I still know very little about it, but if it can make P1 cry, it's gotta be at least decent. Lastly (I think), I snagged Resogun after some quick twitter research determined it was worth its weight in pennies. I remember Reso causing quite a stir when the PS4 was released... in fact I think it was the only game to cause a stir at the PS4's release... but obviously I was much later to the party and had to pick it up on sale. I lied to you, I also picked up Valiant Hearts. That was the sweet little war game we saw at E3 a year or two back. I actually really enjoy war stories (which feels awful to say...?) so I have high hopes for this one. This also means that, to date, I have yet to pay full price for a PS4 game. Sweet. 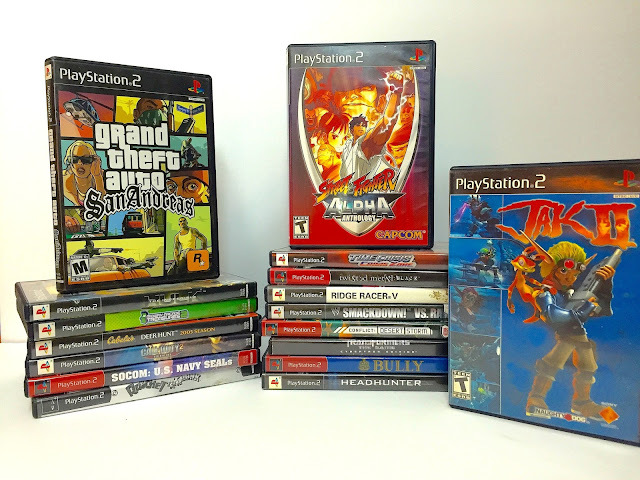 Ratchet & Clank: Going Commando, Headhunter, Street Fighter Alpha Anthology, Bully, Transformers: The Game (Cybertron Edition), SOCOM: U.S. Navy SEALs, Call of Duty 2: Big Red One, Cabelas Deer Hunt, Midway Arcade Treasures 2, Grand Theft Auto: San Andreas, Conflict: Desert Storm, Jak 2, Time Crisis: Crisis Zone, Twisted Metal Black, Ridge Racer V, The Incredible Hulk, and Smack Down vs. Raw all made their way to me from a nosy neighbor. Most of these are games I'm not terribly interested in or already have if I am, but it was a nice gesture, nonetheless. Many of these have already been passed on in the Great Purge of 2016. Oh, I don't know. MORE Zelda puzzles? 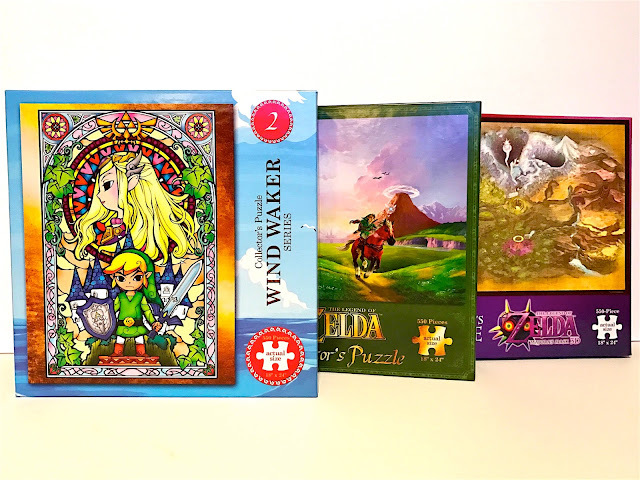 There's always more Zelda puzzles. Including one that I actually forgot to dump in the last KG 'cause it was in pieces on my table... but I'm still enjoying these when I have some downtime. I like to catch up on podcasts while I piece them together and I frame them afterwards! The "stained glass" ones are especially lovely. I think that's it. As always, I'm never really sure, since I forget to note new purchases sometimes, but this'll have to do for what will probably be the final KG in 2016! Any of your favorites here? Awakening is amazing. You'll enjoy it! I wish I felt the same about Fates. I have to give that another try. I've heard good things about El Shaddai. A hidden gem sort of thing! Interested to hear your thoughts on that one. I'll definitely write about Shaddai when I get around to it! My sister swears by Child of Light, and she's never been into RPGs. I need to give that one a try myself (I think I got it with Games with Gold, but have since let my Gold expire, so I'd need to re-up to play it for free), but if you get to it first, I'd love to hear your thoughts. Agreed on the framing of the Zelda puzzles - they look magnificent. Good to hear from you! I will gladly spoil everything for you, if your sister hasn't already. Everyone says good things, I just need some time. Any idea how long it is? I am slowly wallpapering my house in Zelda puzzles. Apparently there are at least three of us out there. I hope you get a chance to enjoy the 3DS Majora's Mask sometime soon. I really had fun playing during that month of CC, and I was also challenged with limited play time. 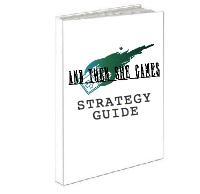 I found the game doable in small chunks if you were able to play frequently enough to remember what you're generally trying to accomplish. I loved Fire Emblem Awakening. I had borrowed it from a friend in 2013, beat it that summer, but got my own copy last Christmas and played through it again to ensure the marriages I deemed appropriate. Beautiful game. Good luck on the continued purge/adulthoodification of your collection and wisdom for best use of your time! Glad to call you "one of the three," D. I think all the Zeldas require a first/replay from me at this point. I'll get around to it, or die trying! I'm glad to hear so many people enjoyed Awakening. Once upon a time, no one even knew what FE was, so I'm glad it's finally gotten some attention! Ben the Rascal here! I hope you like Singularity. I still consider it to be a "hidden gem" from the last gen and it's one of my favorite single-player FPS games, along with F.E.A.R. 2, I think it nails the sci-fi horror aesthetic perfectly. Haha. I may play Bloodborne someday, but I'd like to try out the Souls games first. 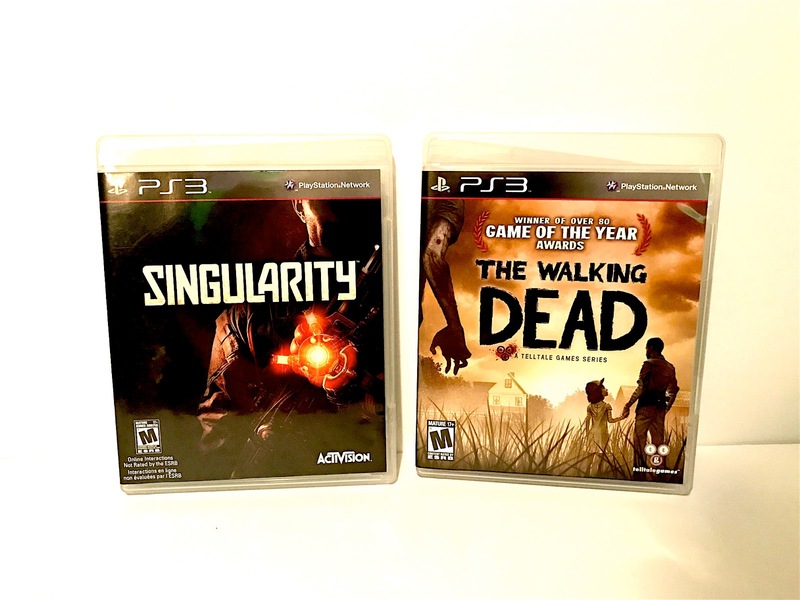 Seems they are a polarizing set, those games.